Essay. Entropy risk affects all assets – if an asset can be “capitalized”, then it has a modality and, therefore, an entropy, and its “development” by capitalization has, necessarily, the same structure as, for example, the development of the firm, which is a much richer structure than mere “compounding”, or even “continuous compounding”, that is fundamental to all of finance and most of economics. In the context of the theory of the firm, the modality, α = R/P, is defined by the ratio of “what is owed to the firm” (R) and “what it owes” (P), and we know that if there is a “conservation law”, which is the balance sheet in this case, then the “payables” and “receivables” that are created and negotiated between the “parties”, who are the firm, the “producer”, and the “customer”, the trading connections, will develop into the 1st and 2nd E-conditions, a×log(a) = α×log(b) and b×log(b) = α×log(a), respectively, where a=p((a)) and b=p((b)) are the measures, or probabilities, of sets (a), of “payables”, and (b), of “receivables, that are in-process, and “the process” is accumulating (P) to (R). In specie, R = P×exp(log(R/P)) = P×exp(r), where r=log(R/P)=log(α) and, hence, the continuous rate of compounding, r, is negative if 0<α<1, and positive if α>1, and Risk(α) = 1 + log(α) has the property that Risk(α)<0 if α<1/e =0.368… , and Risk(α)>0 if α>1/e. The modality is a “state measurement” and we have shown that its value is the “entropy” of the process as Ω(b) = -∫ b(a)×log(b(a))da = -∫α×log(a)da = -α×[a×log(a) – a] = α on [0,1]; please see our Post “(P&I) The Process – System Dynamics” for more information and the two Posts “(P&I) The Process – The WalMart Company B Story” and “(P&I) The Process – Debt & The Company We Keep” for additional examples. An asset – and we consider “liabilities” to be assets in the context of company or process development, rather than the object of mere debt service, which is just the “price of money” and is just a number that we know – that has negative risk is an “opportunity” because its current price is discounted to what we can reasonably expect that it will become, should we work at it, if such work is required. In contrast, an asset with positive risk is an “investment” because we can only be hopeful that it will develop its “full value” and, in practice, some work is required of the asset rather than of us, as “investors” who are not the “producers”. 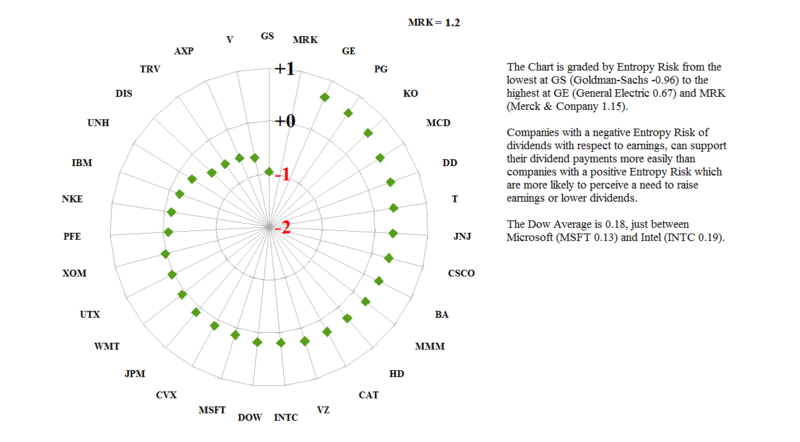 This has some interesting consequences; for example, dividend payments that are in excess of 36.8% of the earnings are “at risk” whereas dividend payments that are less than 36.8% of the earnings have “negative risk”, and the point of view is that of the company rather than the investor, who might take the opposite point of view with no foundation because it is earnings that “create” dividends and not dividends that create earnings (for the company rather than the investor, who does no “work”); please see Figure 1 on the right. We can also “monetize” entropy risk by converting its value into “basis points”. 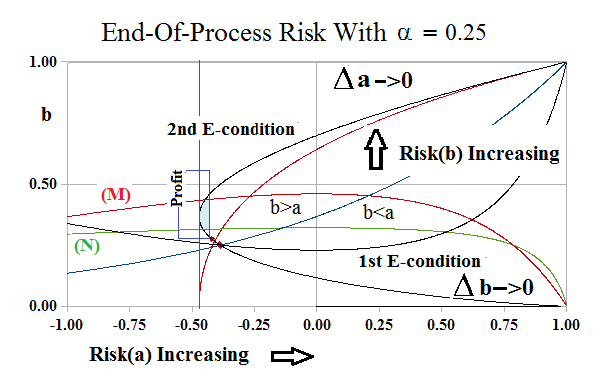 In the case of the firm, the ability to negotiate an outcome at the end-of-process is determined by the “size” of the “blue box” which has the co-ordinates (Risk(a(M)), b(M)) and (Risk(a(N)), b(N)), in our usual notation; please see the “blue box” in Figure 2 on the left, and for more examples, the aforementioned Posts. The area of this box is -(Risk(a(M)) – Risk(a(N)))×(b(M)-b(N))/(1-1/eα) where we have “oriented” the box to the “producer preference” of “less a(M) is preferred to more a(M)” and “more b(M) is preferred to less b(M)” meaning that in the absence of negotiation, the default solution favours the producer. We have also “normalized” the box by the relevant area which is between Risk(a) = 1-1/eα, on the left, and Risk(a)=1 on the right; please see Figure 3 (on the left). 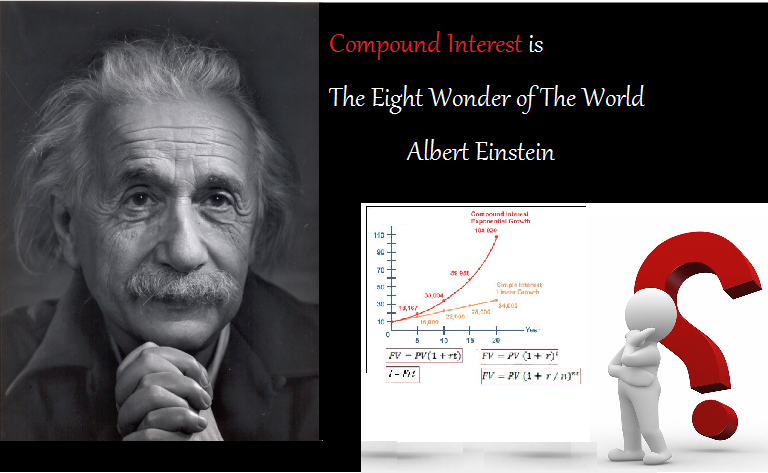 The “risk” is formally infinite (“indeterminate”) at α=1/e=0.368… because that’s Company D, and we can’t leave Company D without some help, which is available but we need to ask for it; please see our Post “(P&I) The Process – Debt & The Company We Keep” for more details. For more details, please see our Posts “(P&I) The Process – The 1st Real Dollar” which shows how a “currency” gets its value from the “subsistence economy” at the Company D modality, and “(P&I) The Process – The Guns of August” which explains how that modality actually “works”.